Buyer's Guide: Dressing Room, Tack Compartment, Living Quarters, or None of the Above? 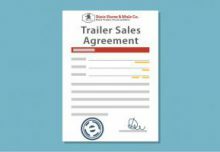 You are ready to buy a horse trailer, but not sure if you want to buy new or used. Here are some points that can help you decide. Our staff will be glad to assist! One of the next things we will need to know is if you need any kind of dressing room or tack compartment or a horse trailer with living quarters. Or maybe you just need to haul horses. If you are not sure, here are a few points that can help. Do you need a place to change clothes? Or, maybe you need a place to haul supplies. Then you may need a dressing room. Dressing room refers to a room walled off from the horse area, usually at the front of the trailer and usually with a separate entry. The dressing room wall can be stationary or can swing. The majority of horse trailers we sell have some type of dressing room, with the majority also containing saddle racks. Do You Need Tack Storage? If you need a place to haul saddles you will need a tack compartment of some kind. If you also need a place to change clothes or store supplies and a separate place to haul saddles/tack you may need a trailer with a dressing room and a tack compartment. 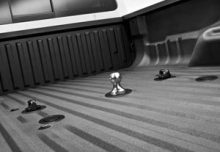 If you need lots of storage space you may need a midtack compartment in addition to the front and rear compartments, and you may want under-manger storage as well. When we refer to tack rooms or compartments we are referring to areas set up to haul your saddle/s in the horse trailer. Some terms we use in discussing tack storage are front tack, rear tack, collapsible rear tack, permanent rear tack, midtack, side tack, and tack under mangers. 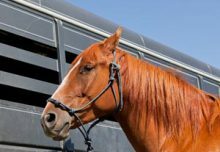 Slant load horse trailers, the vast majority of horse trailers sold, may have either a front tack or rear tack, or they may have both, many times with the ability to move the saddle rack to either location. Rear tack walls can be collapsible or permanent. Trailers with rear tack compartments usually have double rear doors, with one door for tack and one for horse loading, but occasionally seen are rear tack compartments with side access. Tack storage in straight load trailers may be found under mangers accessed from the outside through small doors, or in the dressing room (front tack). Both straight and slant loads may have midtack compartments between the dressing room and horse area. Named for their position approximately midway of the trailer, midtack compartments reach from one side of the trailer to the other, and may or may not be set up for tack storage. Many times they are used as separate “mudroom” entry, or as storage for hay and feed or other supplies rather than as tack rooms. Occasionally you will see a midtack compartment only big enough to hold saddles. These are sometimes known as side tack compartments. Do You Need Living Quarters? If you need a place to cook, bathe and sleep you may need a horse trailer with living quarters, or LQ as they are commonly called. In addition to full living quarters you will see partial living quarters, sometimes called weekenders or weekend packages. You will find that the term “living quarters” has variety of meanings, as does the term “weekend package,” or “weekender.” For example, at Dixie Horse & Mule Co. we list all trailers with any living quarters features as “living quarters,” and do not use the term “weekender” to describe partial living quarters. LQs may have slant or straight walls, with the majority being slant. Since the living quarters are installed in the dressing room saddle racks are usually located in a rear, mid or side tack compartment, or occasionally there is no tack storage. Additional storage space is available if the trailer has mangers. Do you only haul horses and not need any type of storage? Then you may need none of the above! 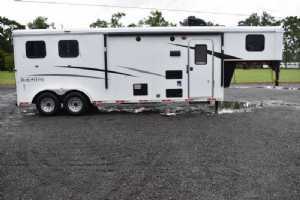 Stock trailers with no dressing room or tack room may be perfect for you, or we also have compact Sundowner Charter enclosed straight load bumper pulls with no tack or dressing room. We know that what it really comes down to in every case is value–the features you want at a great price. At Dixie Horse & Mule Co. we stock a wide variety of horse trailers with lots of useful features, all priced very competitively to help you get real value with your purchase. If you have any questions about horse trailers and what will work best for you, call, chat, or email Dixie Horse & Mule Co. Over 50 years of experience with trailers, horses, mules and hauling – we’re here to help you! 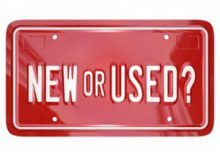 Enclosed or Stock Side Horse Trailer? 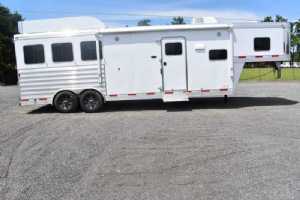 New Horse Trailer or Used Horse Trailer?